Titanium oxalate 250 gram pack for mordanting cotton and plant fibres. Gives orange shades with tannins and yellow dyes. 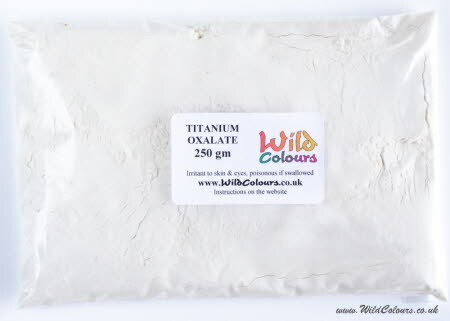 Titanium oxalate also increases light and wash fastness - SAVE £4.50 over the 50 gram price of Titanium oxalate. Titanium oxalate is weighed and sealed in a polythene bag. The bag is then labelled, placed in a padded envelope and posted to you First Class.